Of the many I could write about, I have to tell you about one that I have finally gotten around to reading—oh, how I wished I had studied it when we received it earlier this year as I would have been promoting it with more vigor. 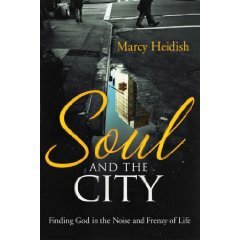 Soul and the City: Finding God in the Noise and Frenzy of Life by Marcy Heidish (Waterbrook; $13.99) is a small-ish paperback, wonderfully written, beautifully done, and is truly a book of spiritual formation. Heidish is a great writer, cites fascinating sources to very good effect, weaving quotes and passages and illustrations seamlessly. What is so delightful and helpful (praise be to God) is that she is so utterly ecumenical; she will be citing Eastern Orthodox or Catholic classics like Anthony Bloom or Julian of Norwich and then tell us about A. W. Tozer; she cites reformational scholar Richard Mouw and draws on Tilden Edwards and Evelyn Underhill. She uses Richard Foster and Dallas Willard and Eugene Peterson, but, as a novelist herself, she knows how to use a great literary passages. I loved a passage she cited of Frederick Buechner that I had forgotten. Her use of Spoon River Anthology when talking about the last days of her atheist father was poignant and powerful. I want to watch Grand Canyon again, after her making note of one scene about the longing for community. This sweet book celebrates the God of the mundane, the spirituality of the ordinary, the way in which classic spiritual disciplines can help us engage life, embrace culture, dig into our places and make a difference, especially in compassionate service to others. Although some of her stories comes from her extensive work with homeless women, serving in shelters and community groups, much of this is just how to walk more faithfully with God when we are really, really busy, pressed and stressed. She describes her small prayerful escapes into the sanctuary of downtown churches, and she is (again) delightfully ecumenical. I suppose she is Episcopalian or Catholic as she is so familiar with their liturgical architecture and sacred seasons. Yet, she readily describes involvement in store-front missions and evangelical community churches; she reads Jewish prayers and attends charismatic praise services. Heidish gets around, has tons of urban and urbane experiences and tells her story with a light touch—there is no pride or over-wrought, larger-than-life stories. Anyone who feels the fast pace of our high-tech world, who works in offices or commutes in exurbs, or who wonders how to be more sane within our secularized culture of power and politics, concrete and ether, noise and speed, will love her invitation to spiritual growth and inner peace, set precisely in the urban heart of our crazy times. It isn’t about urban ministry, as such, but about contemplative practice while on the run, in the real world. Happily, Heidish celebrates the city, too. It is not all corruption, tension, and waste, grim and crime. She savors the delights of the availability of various foods—she is attentive to the goodness of ethnic diversity—and art and expanding cultural horizons and diverse religious communities. Yes, she writes tenderly about volunteering at a hospice or homeless shelter, but she also has friends in the financial industry, writes about wonderful penthouse vistas, and works, herself, as successful writer, in journalism, film and media. (She won awards for doing the novel from which the Cicely Tyson movie A Woman Called Moses, was adapted.) Her way with words is a blessing, making this book not only a blessed bit of wisdom, but a joy to read. When I speak in Baltimore, I will surely have to highlight a few others. Here are some. 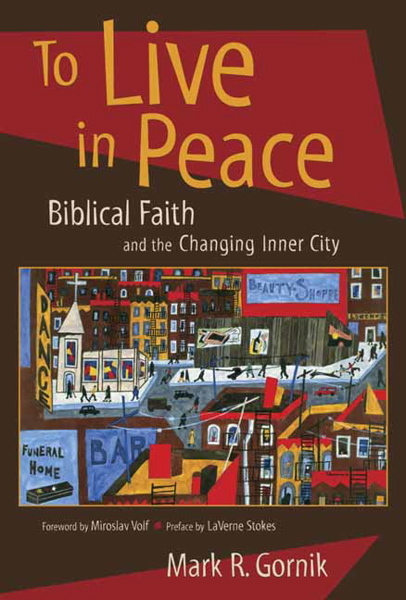 To Live in Peace: Biblical Faith and the Changing Inner City Mark Gornick (Eerdmans) $22.00 This is the best book on the subject, bar none. Gornik tells of his years of work in Sandtown, the West Baltimore neighborhood where he moved, and the church that emerged. This has the most profound theological orientation, the best and most energizing Bible study, and the best sociological insights of any urban ministry book on the market. Thoughtful and a bit demanding, it is the best. Forward by Miroslav Volf. Simply a must. A Heart for the Community: New Models for Urban and Suburban Ministry edited by John Fuder & Noel Castellanos (Moody Press) $34.99 The brand new collection of essays is an official publication of the esteemed CCDA (Christian Community Development Association) and it includes nearly 30 authors. As Bob Lupton of Atlanta writes, “With cities gentrifying and poverty suburbanizing, the definitions and practices of urban ministry are changing. A Heart for the Community is right on time.” This includes some of the best evangelical practitioners in the nation, sharing fresh insights—very up to date! There are other excellent anthologies of this sort; we really recommend the one edited by the late Harvie Conn & Manuel Ortiz called Urban Ministry: The Kingdom, The City, and the People of God (IVP; $35.00.) It is most likely the best one volume collection. Highly recommended. is a fabulous little classic, a great place to start I cannot tell you how I respect this guy and the reverberations of his decades in urban work. Theirs is the Kingdom: Celebrating the Gospel in Urban America Robert Lupton (Harper) $13.95 Tony Campolo writes, “The story of Lupton’s ministry is one of the most inspiring in America. Those of us who are trying to accomplish something of value in urban settings look to him and his co-workers as models.” Passionate and stimulating, this is a great little classic, another that is excellent to start with; the chapters are short, there are tons of stories, it is powerfully written. (Brazos) $20.00 You may know of my love for James Howard Kunstler, the fiesty and brilliant writer who has popularized “new urbanism” in books like Home From Nowhere; his scathing critiques of the ugliness of our man-man landscapes are legendary. 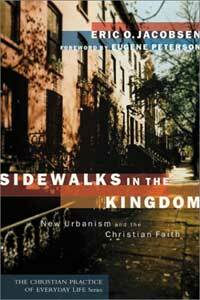 Here, Jacobsen offers a very helpful, beginners contribution to how church folks can care about their towns–large or small–and how thinking about stuff as mundane as zoning and sidewalks, really matter in God’s good world. My, my, if only folks paid attention to half of this, we’d have a more charming and sustainable and just built culture. One need not be a city planner or architect to read this. Highly recommended. Churches That Make a Difference: Reacing Your Community With Good News and Good Works Ronald J. Sider, Philip N. Olson, Heidi Rolland Unruh (Baker) $21.99 Remarkable research was done among churches (in the Philadelphia area) that were doing truly wholisitic, faith-based, multi-dimensional urban ministry. Some are historic minority churches, some are mainline denominational parishes, some are independent evangelical works. From these truly effective congregations and their wholistic outreach, they drew principles and came up with best practices. This really is a fabulous handbook for how to get more deeply involved, making a difference. Linking Arms, Linking Lives: How Urban-Suburban Partnerships Can Transform Communities Ronald Sider, John Perkins, Wayne Gordon, Albert Tizon (Baker) $14.99 I’ve raved about this before and want to commend it again. Especially for those who are not in urban church settings, this is a missional vision that is inspiring, with lots of great stories and concrete examples of great partnerships and mutual sharing. Biblical insight, practical wisdom, a field guide like none other, this is how to move closer to what surely God intends. You won’t regret spending some time in these stories, being inspired to dream up new initiatives. New Neighbor: An Invitation to Join Beloved Community Leroy Barber (Mission Year) $14.99. We have mentioned this before—it seems we are one of the few stores that are promoting this lovely collection of short pieces illustrated by stunning, full-color photography of Brian T.Murphy. A graphically well-designed, pocket-sized paperback, these are stories–almost call and response, highlighting urban need and injustice, and neighborly care and advocacy–that hold up ordinary folks building the beloved community. This is a project of Mission Year and tells their stories, although any of us could be new neighbors. This will show you why and how. Beautiful, in so many ways. 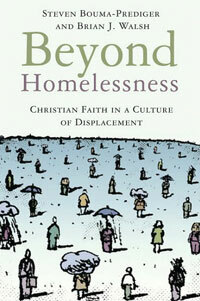 Beyond Homelessness: Christian Faith in a Culture of Displacement Brian Walsh & Steven Bouma-Prediger (Eerdmans) $24.00 I have raved about this before, and I am convinced it is one of the most insightful and innovative books of my lifetime. (Ha—my comments were even cited in a footnote in an article about the book in The Christian Scholars Review.) Not for beginners in Christian studies, I suppose, Beyond Homelessness is nonetheless an unparalleled, Biblical-rooted view of what it means to be at place, why we are or are not at home in this world, how the ecological crisis might provide a lens for healing and transforming faith, and how a vision of God’s redemptive homecoming/restoration could allow us to better engage not only inner city homelessness, but the more general postmodern agnst of our assaulted, beloved world. There are great Biblical interludes, remarkable stories of urban networks among the displaced and homeless, good environmental theology and a worldview that dares to believe God wants to us to care so deeply that we truly find shalom—home—here, now, granted as gift from our Divine Homemaker.